Our professional consultants have over 5 years experience each and have been trained by the Center for Babywearing Studies. Learn more about Amy and Marcie on our About page, and continue on this page to learn more about scheduling time with them for classes, consultations, and fit checks. Breastfeeding While Babywearing is offered bi-monhtly at Milagros Family Room in NE Portland. Find the latest class offering and register here. 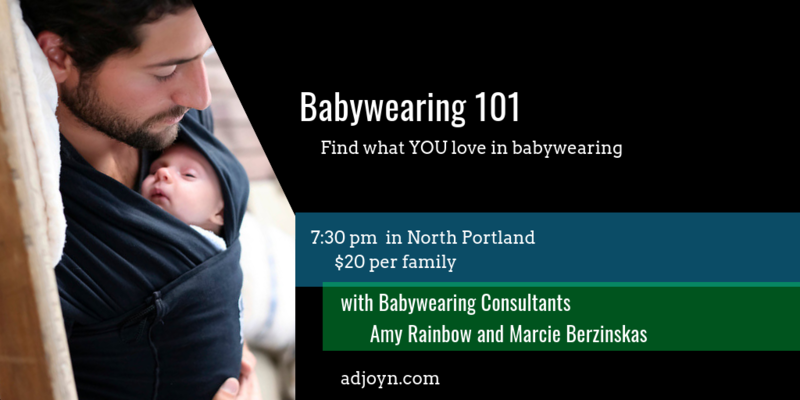 Babywearing 101s are offered monthly in NE Portland. Find the latest class offerings and register here. Not sure which baby carrier to get? Want to learn more features of your carrier, or how tackle a new skill like breastfeeding while babywearing or back carrying? ​A consultation is available for you! In our one-on-one session we can focus on exactly what you need. Choose a theme I've used before or dream up your own: figure out what carrier is best for you and your baby, learn how to use a carrier you already have, learn advanced skills like carrying two babies - the possibilities are only limited to what we can fit in our time together! Consultation sessions are appropriate for babies of any age and caregivers of any skill level. Carrier (and baby!) not required. $95 for a 90-minute in-person consultation (schedule here). Already have a carrier but want to make sure it is being used correctly? Have a pain point you need figured out? Want some tips on making your carrier easier to use? Then a fit check session is right for you! Want to gift a session or a package of sessions? Or you want to have a session but not ready to schedule? Use our gift certificates - great for you, or friends and family! Featured: Baby Gear Safety Check - get a car seat safety check at home home AND a babywearing consultation. Great for new parents! Save $25 with our safety gear check package! ​All packages listed above in babywearing consultations also available.